​The Damerel Belles women's ensemble, conducted by Trefor Farrow, are performing as part of the Ashburton Choirs Festival 2019, with a repertoire drawn from both classical and lighter arrangements (more details below). Tickets £6 (£2 under 15) from choir members, from Ashburton Information Centre or contact collatisingers@gmail.com. There may be tickets on the door if there are any remaining. The Collati Singers is a chamber choir conducted by Trefor Farrow, which rehearses in Bittaford near Ivybridge. The choir’s name comes from the Latin word collati, which means bringing together, as in 'to collate'. Trefor and his wife Gillian (soprano) set the choir up in 2013 and invited people from various choirs which Trefor has conducted over the years to join, alongside new singers who responded to recruitment posters, and the choir has expanded mainly by word of mouth since then. Our aim is, in the main, to sing challenging unaccompanied music from the medieval and Renaissance periods, as well as more recent works from twentieth and twenty-first century composers. In addition a lighter repertoire, including a cappella arrangements in jazz style of well-known songs, is occasionally included in the programme. The choir has now grown to a membership of over 30 and has gone from strength to strength. We rehearse every Tuesday evening in Bittaford Methodist Chapel PL21 0DX. The programme includes mixture of classical and lighter genres, including pieces by Purcell and Willcox, and ending with a performance of 'Jazz Songs of Innocence', five poems by William Blake (1757-1827) set to music by Bob Chilcott (b. 1955). The Ashburton Choir's Festival is non-competitive! The Damerel Belles will be performing in the first half, whilst the second half of the evening features The Big Noise Chorus. ​Tickets £10. These can be bought online through the Abbey website www.buckfast.org.uk, from the Abbey gift shop, or from the Abbey stewards on the door on the evening of the concert, if there are any remaining. ​Featuring Goodall's stunning Eternal Light Requiem with tenor soloist Matthew Oakes and soprano soloists Teresa Stubbs and Gillian Webster, accompanied by acclaimed organist Peter King, alongside unaccompanied baroque and Renaissance motets. ​No tickets - just turn up. ​​​Christmas Concert - to include Bob Chilcott's On Christmas Night, Vaughan Williams' Fantasia and a selection of more familiar Christmas music. The autumn programme concert in Buckfast Abbey was Palestrina’s Stabat Mater, Taverner's Western Wynde Mass and Morten Lauridsen's Lux Aeterna. Organ - Richard Lea. A Boy and a Girl and Sleep by Eric Whitacre, a selection of arrangements of folk songs by the Kings Singers and various motets and part songs. ​The Collati Singers are performing in the first half of this concert, which is shared with The Singers Upstairs and The Devonly Singers who will sing in the second half. Tickets £6 available from choir members or on the door. 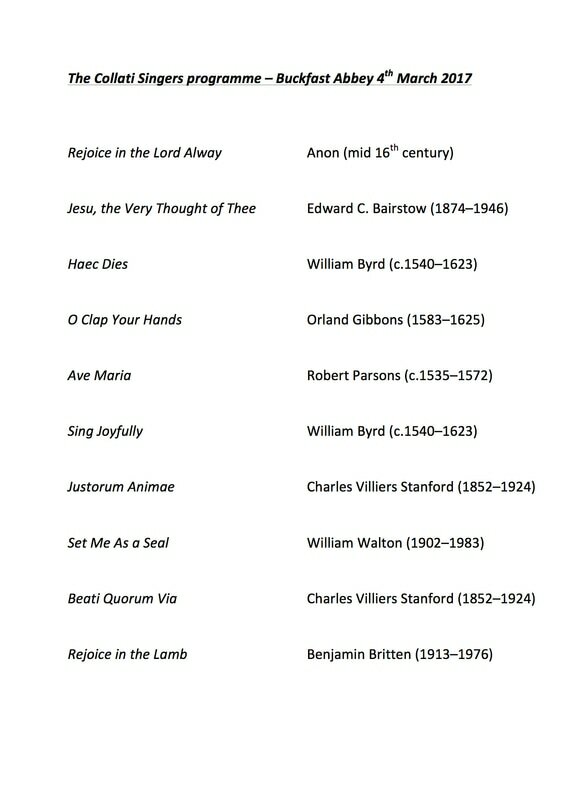 and unaccompanied ancient and modern church music (Byrd, Gibbons, Parsons, Bairstow, Walton etc). Soloists in the Britten: Clare Lash-Williams (soprano), Cheryl Stead (alto), Sue Hadow (tenor), Den Anderson (bass). Solo in Walton: Terry Ash (tenor). ​​Christmas concert - Poulenc Christmas Motets and seasonal music ancient and modern. Programme to include Bach Lobet den Herrn, Tye Euge Bone mass, Britten Hymn to Saint Cecilia and Richard Rodney Bennett Missa Brevis. ​Christmas concert - advent and seasonal music. Howells' Requiem, Palestrina’s Missa Papae Marcelli and motets by Jenkins, Gjeilo & Lukaszweski. Byrd Mass for Four Voices, Lauridsen Lux Aeterna, Palestrina motets. The first concert by the choir newly formed by Trefor and Gillian before it became The Collati Singers. ​Tickets £5 on the door or from choir members. Richard Rodney Bennett Missa Brevis, Lauridsen Chanson des Roses, Palestrina motets, two songs by Gillian Webster sung by Clare Lash-Williams, and a selection of familiar songs in light jazz style.